Many exciting developments have emerged over the past few months, including the opening of our new office in Sebastopol, CA. As a newly established non-profit organization, Transition US is working in close partnership with the Transition Network, as well as the Post Carbon Institute to catalyze, inspire, encourage, network, support and train communities throughout the U.S. as they consider, adopt, adapt and implement the Transition model. 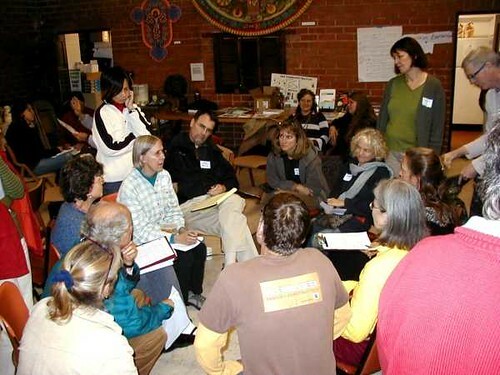 We held five remarkably successful Training for Transition (T4T) courses in December 2008. 21 Transition Trainers from across the country graduated from the first "Training the Trainers" (TTT) course held in San Francisco, led by Naresh Giangrande and Sophy Banks who launched the original Transition Training courses in the UK.Our new trainers bring a wealth of knowledge and experience, and they are ready and eager to share their expertise with the growing Transition community. Upcoming Training for Transition (T4T) courses have been announced in Vermont, Illinois, California, New England, New York, New Jersey, Indiana, Florida and Washington. We also have a new training in Abbotsford, BC (Canada) in March, and 25 more in the planning process. In December, we managed to grab the last days of Naresh Giangrande and Sophy Banks' US training tour before they left the country.Those remarkable two days truly "gelled" the energy here. In retrospect, the T4T was perhaps our area-wide Great Unleashing. We're now preparing for our second core team meeting for Transition Los Angeles and what a journey these brief two months have been! L.A. is an area of absolutely massive scale. But we're starting with local: all the participants from that December T4T are starting in their own neighborhoods, no matter how far-flung and separate those neighborhoods might be. In "designing from pattern to details," we've come to regard the massive scale of L.A. in the form of local "pods" or pockets of local activity where most of the awareness-raising, physical projects, and working groups will take place. 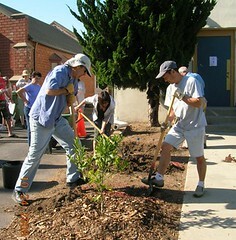 Visit Transition Los Angeles online at http://transitionla.blogspot.com. Sandpoint Transition Initiative "unleashed" the idea of transition and the community's response was overwhelming as over 500 folks showed up at the Panida and then the next day 120 folks showed up to transform their interests into working groups designed to address the issues facing our community. The working groups are: Art, Community Design, Economy, Education, Energy, food System, Health, Heart and Soul of Change, Natural Resources, Mobility and Zero Waste. The working groups are dedicated to working on projects and developing a plan to help create a more sustainable, resilient and vibrant community.These groups are all ready working starting to make a difference and over the next few months they will all be offering the community new ideas and project that will allow folks of all ages to become involved. The working groups meet on a regular basis and all meetings are open to the community. Learn more at www.sandpointtransitioninititiative.org. Transition Initiatives are reinvigorating traditional life skills that are essential in making the transition to a more localized economy and a carbon-constrained future. The process of relearning these basic skills is called The Great Re-skilling, and Transition Louisville is offering an ongoing curriculum of classes, workshops and courses that draw on the expertise of those in our communities who have gained the expertise that many of us will need in order to be more self-sufficient. On February 18, 2009, Transition Louisville hosted an event to learn from organizers of the Community Roots Neighborhood Supported Agriculture, a South Boulder CO neighborhood-based initiative. Community Roots serves to build community self-sufficiency through intensive food production and distribution, by using urban land, in the form of a patchwork collection of front yard, backyard and church plots and powered by community volunteer effort. Forty-five people attended the talk and we are taking steps to bring this NSA approach to the Louisville Transition! Read more. A new version of TransitionUS.org is in the works! It will feature resources and information for those interested in engaging in Transition across the US. We plan to launch our new site in April. In addition to the main site TransitionUS.org, you might also find our partner site TransitionUS.ning.com useful. This is an independent social networking community that facilitates communication among folks within the United States who are interested in learning about or implementing the Transition model in their locale. You can also locate your state site, browse postings by members and contribute your ideas and experiences. If you've read the Primer and are "mulling over" whether you might set up an initiative in your locale, then we want to hear from you! Similar to the Google Map of mullers maintained by the Transition Network, we want to connect mullers in communities across the US and support their efforts. That way, anyone else from your community who gets in touch with us can be put in contact with you and vice versa! With growing interest in Transition across the country and the launch of new Trainings in the coming months, we are looking forward to the exciting work ahead. To keep in touch, join our mailing list!